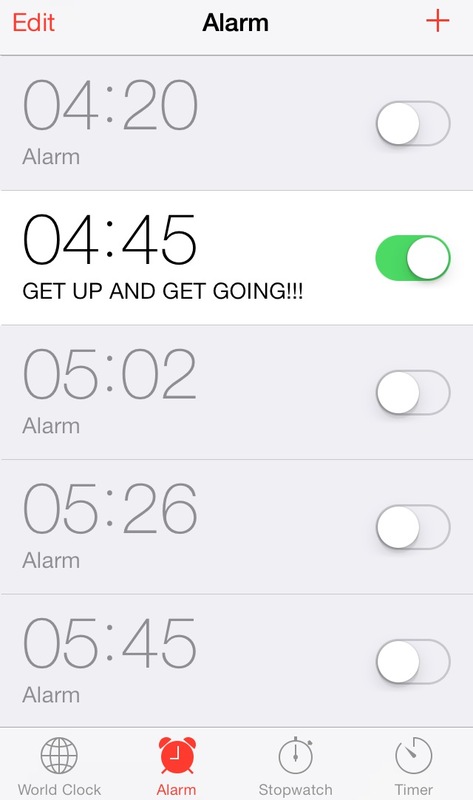 5am wake up – how YOU can do it too! 5am – actually 4.45am is the time that my alarm goes off each wake day morning. Not because I have somewhere important or exciting to go to. Actually, correction; I do have somewhere exciting to go to – my kitchen table to start a new day of business. I love that time of the morning when it’s dark and most people are sleeping. I get a lot done and it is a great start to the day. I plan my diary in such a way that I don’t have anywhere to go to until at least 8.30am. I no longer schedule breakfast meetings – not because they are too early, but if I’m going to be scheduling an early meeting, the last thing I want to do is waste time by ordering food and eating during it. I often get asked why I wake up so early. But why not? I love my job, I absolutely love what I do – and if I can create more time in the day to do it, then why would I not? I’ve trained myself to wake up at that time each morning that I often wake before my alarm goes off. It’s got a lot easier but it’s not always been that way. I now like the idea of doing two and a half hours work before I actually get to the office. Often, that time is worth more than two and a half hour because there are no interruptions or no calls disturbing me, so I get more done. Waking up and making it productive doesn’t happen just by setting my alarm clock and making sure I’m out of bed. I make sure I get enough hours of sleep. When I talk about enough hours, often that’s about 5 hours. That’s enough for me – but I understand it’s not enough for everyone. I do believe sleep is important, but I just don’t find it easy to sleep and sleep and sleep – my mind is forever ticking. The night before, I write a to-do list specifically for the hours between 5am and 7.30am. This is so I know what to do when I hit my kitchen table in the morning. I’ll be honest, my mind isn’t always ticking as it usually is once I’ve had my first cup of caffeine. So when I have a to-do list, I find it easier to start working by following the list I’ve prepared. I also love the feeling of being awake and working whilst everyone else is sleeping. It’s such a lovely and peaceful time of day. Now between these hours I don’t always do actual work, I do some self-development work too and often that can be reading a book, watching a TED video, writing in a diary and even exercise. I always have a mixture of activities to do at the time and split it between personal stuff and actual work. I always time these activities just to make sure I don’t get carried away with them! By just getting up at 5am, and doing two and a half hours of work a day, this equates to a day and a half of an average working day – without including weekends! I cram in a few more hours when I get home and at weekends too. I’ve got a long list of things I want to achieve and I won’t achieve it by just working from 9 – 5. It takes a lot of practice but it will soon become a habit and what’s more, you will start to enjoy that time. –	If you don’t usually wake up until 7am, then don’t put your alarm on for 5am – you’re setting yourself up for a failure. Start by going to be half an hour earlier and waking up half an hour earlier. Does this for a whole week and then for the next week adjust it by another half an hour. –	If you can put a motivating quote or note to appear when you’re alarm goes off, or even a post-it not on your phone that motivates you getting up earlier – it may just help! I used to do that in the early days. –	Have something to wake up for; Plan to work on something exciting, read a book you’ve always wanted to read or whatever it is you want to do before you start your normal working day. If you wake up tired with no idea what you’re waking up for then it’s not going to be productive. Having a to-do list or a checklist usually helps. –	If you have a lot on your mind, you may find it helps writing it down and that way, it is there for when you wake up and won’t keep you awake. –	If you find it difficult to drift off to sleep at an earlier time then it may help by playing an audio book. I feel an audio book helps me drift into sleep a lot quicker and easier and it’s like someone reading you a bedtime story. The beauty of it is that you have a timer so can have it only playing for a certain length of time. If you need to fit more hours into your day then waking up makes sense. Just remember, take it slowly and it takes practice for it to become a habit! Let me know how you get on or drop me a line if you want to know more about it!